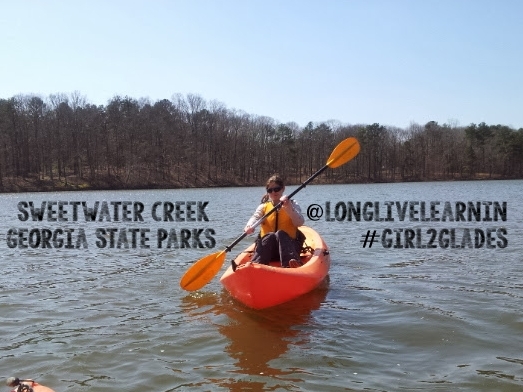 This past weekend, I joined some adventurous women learning how to kayak at Sweetwater Creek State Park. I spent the next hour and a half laughing, chatting and paddling against the wind with these inspiring women. As if the instructor, Kelly Fellows, wasn’t empowering enough – I was watching women overcome fears, and the challenge of that constant wind, to get outdoors and learn something new. Visit the Sweetwater Creek State Park Official Website to register for upcoming sessions of this class on April 13 & 19, 2014. Georgia Family Explorers! A Group that Gets Outdoors to Explore Georgia! Oh my! Learning how to kayak sounds like so much fun. I’ve always wanted to try it but I’ve always had my fears but I know learning how to do it properly would make it all the more fun.